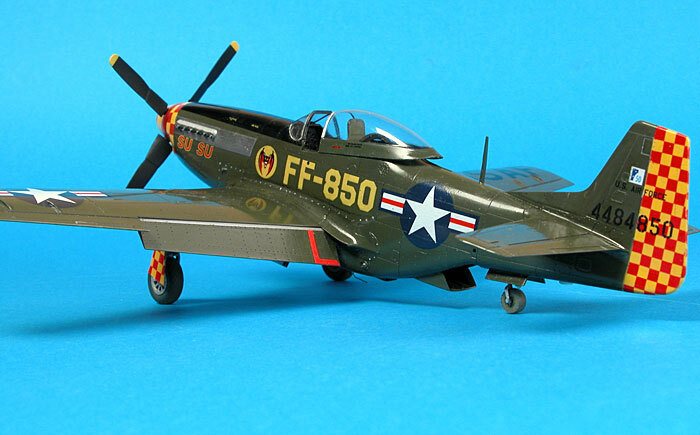 In 2004 we are privileged to see a surprising number of P-51D Mustangs still flying 60 years after the veteran thoroughbred rolled off WWII production lines. 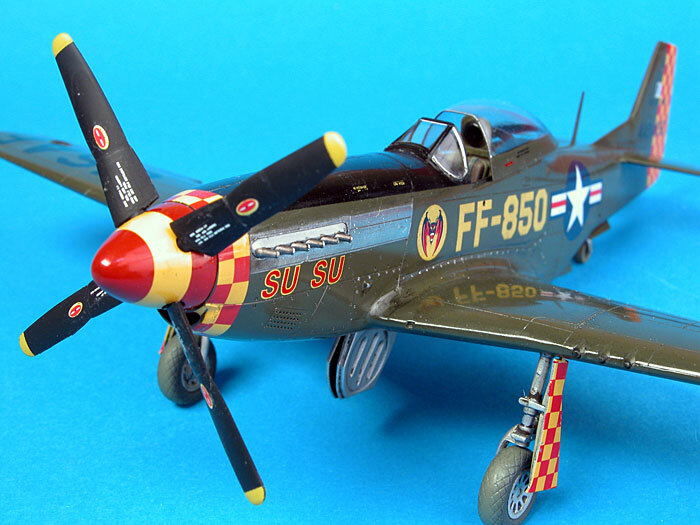 One of these Mustangs, attractively restored to flying condition, is the P-51D "Su Su". This airframe was originally recovered from Indonesia in 1978 and passed through several hands before being purchased by Bill Freeman in 1998. "Su Su" received its unique colours and markings at this time, and it wears the same scheme today. "Su Su" is currently owned by Anderson Aviation. 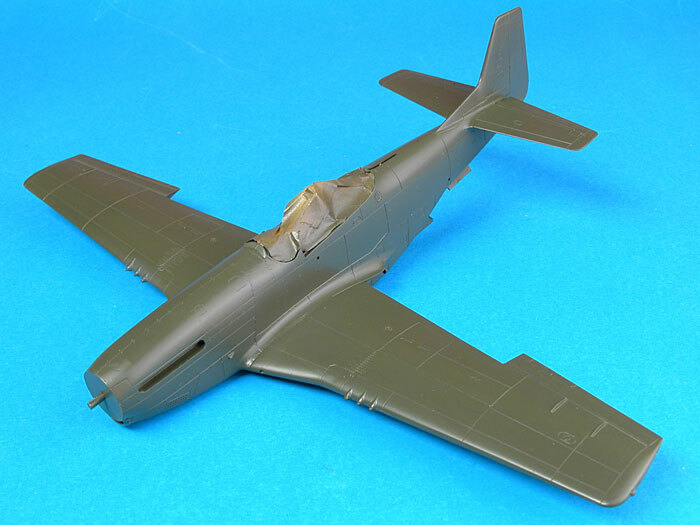 When Bill Freeman asked if I was interested in building "Su Su" in 1/48 scale, I did not have to think about it for long. 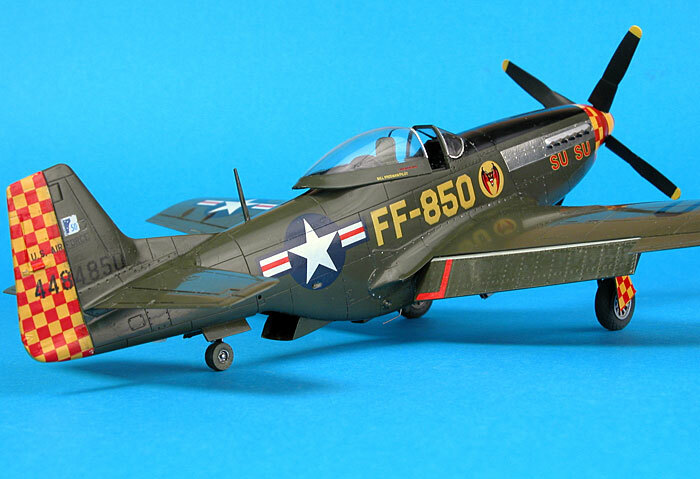 Tamiya's 1/48 scale P-51D Mustang is an almost viceless kit. There are a few minor accuracy issues, but I wanted to build the kit straight from the box and focus on the paint job. Construction commences in the cockpit. 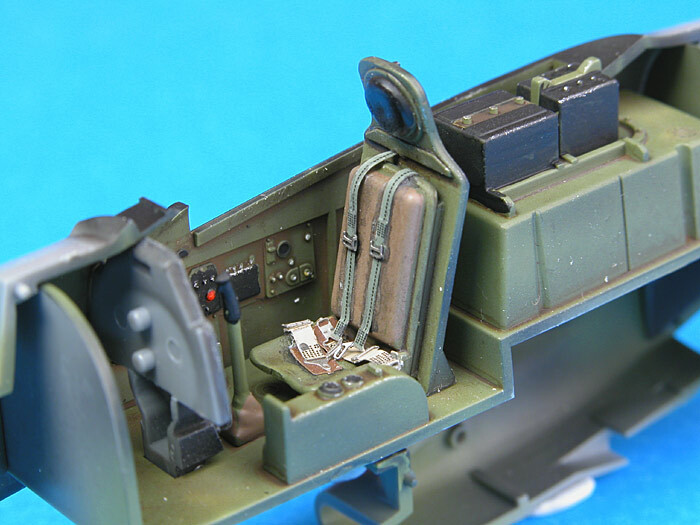 Sidewall detail is moulded on the inside of the fuselage halves and the seat is simplified, but careful painting produces an acceptable result. After spraying the cockpit components Interior Green, I applied a wash of thinned Raw Umber oil paint. The resulting artificial shadow adds depth to some of the shallow cockpit features and also imparts a slightly grubby, used appearance to the front office. 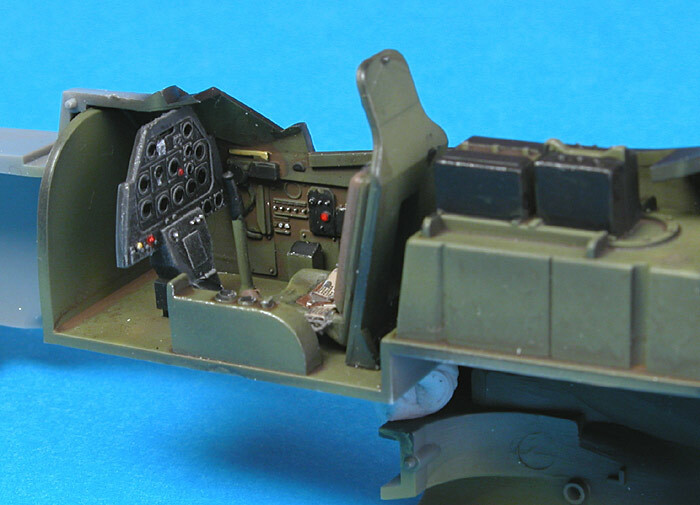 The only addition to the cockpit was a harness from Eduard's 1/48 scale USAAF/USN Color Photoetch Harness set. These photoetched parts are pre-painted/printed and ready to use. Detail is fantastic. The final effect is very realistic - right down to the stitching on the straps. 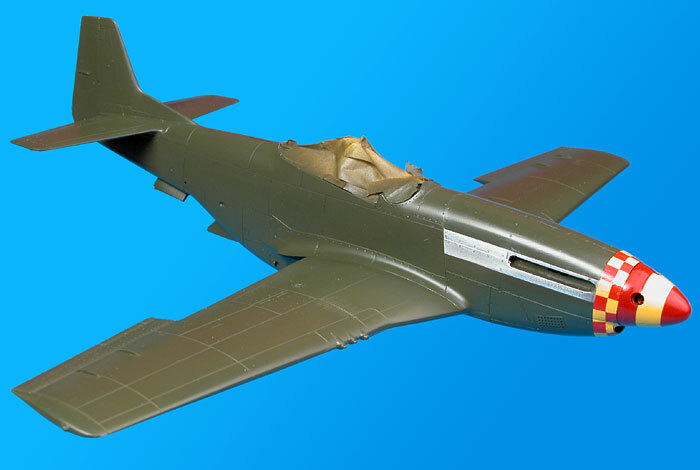 Except for the Eduard Color Photoetched harness, the cockpit was built straight from the box. The model fits together almost perfectly. The warbird "Su Su" is not fitted with the bulky WWII radio and battery behind the pilot but, in keeping with my "straight from the box" approach, I did not alter this area. A little extra time was spent painting and weathering the wheel wells before main construction was begun. There is almost nothing to be said about the remainder of construction. This really is a classic "shake and bake" Tamiya kit. 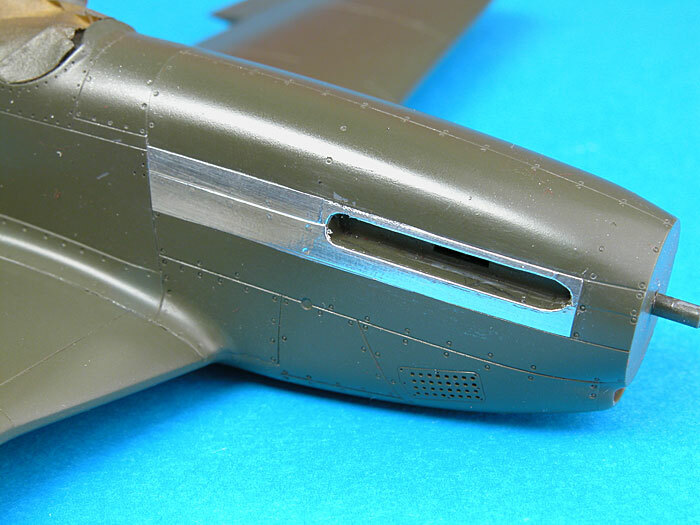 A little filler was required underneath the big fuselage intake, but there were no visible gaps or seams anywhere else on the model. 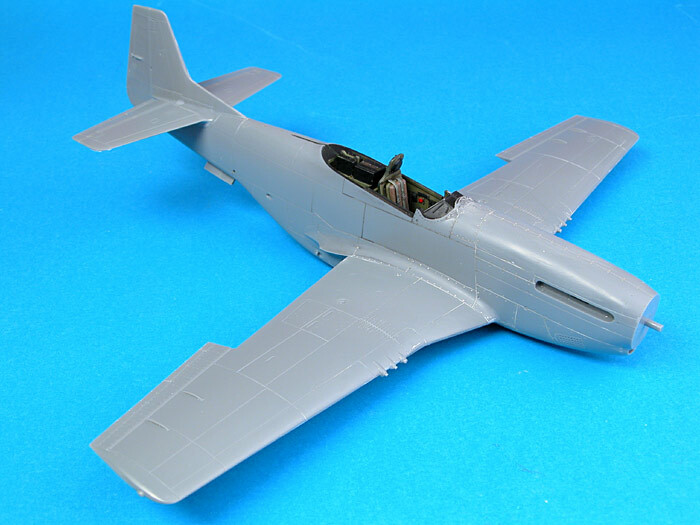 A few short hours of assembling the main components and the model was ready for paint. 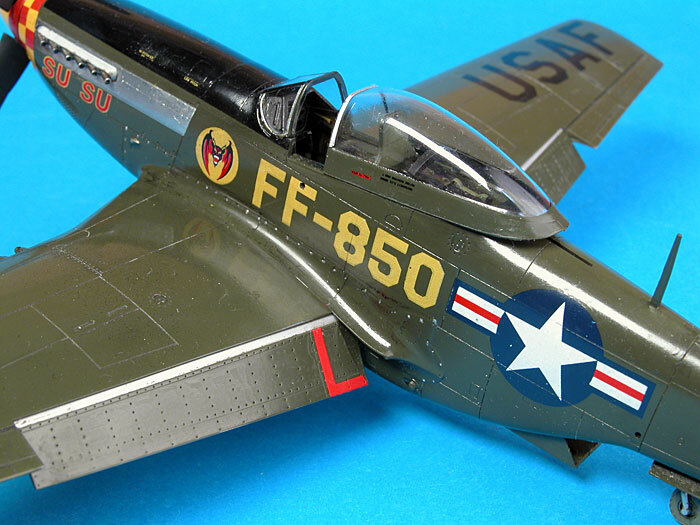 High gloss finish - three words to strike fear into the heart of any military aircraft modeller. The flat finish on most warplanes hides a multitude of sins. No such concealment is offered by high gloss paint - just the opposite in fact. Every tiny blemish and imperfection is amplified by the shiny smooth surface. At first I suggested to Bill that I would paint "Su Su" in a satin finish. I almost convinced myself that this would be a fair representation of "scale sheen", but in my heart of hearts I knew that I was simply scared of the scrutiny invited by high gloss. I bit the bullet and decided to try to represent the mirror-like sheen so obvious in the photos of the real aircraft. A smooth base coat was imperative to provide a foundation for the unforgiving finish. 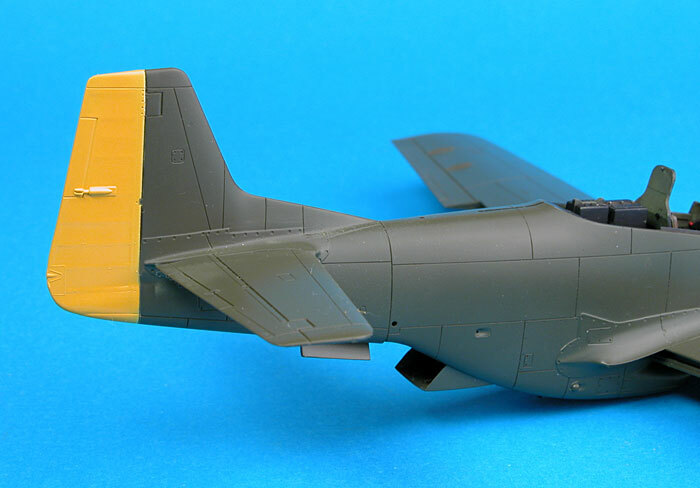 I mixed Polly Scale RAF Dark Green with around 30% Polly Scale Gloss. Polly Scale Gloss acts as an effective thinner but also adds a useful sheen to the otherwise dead flat Polly Scale acrylics. 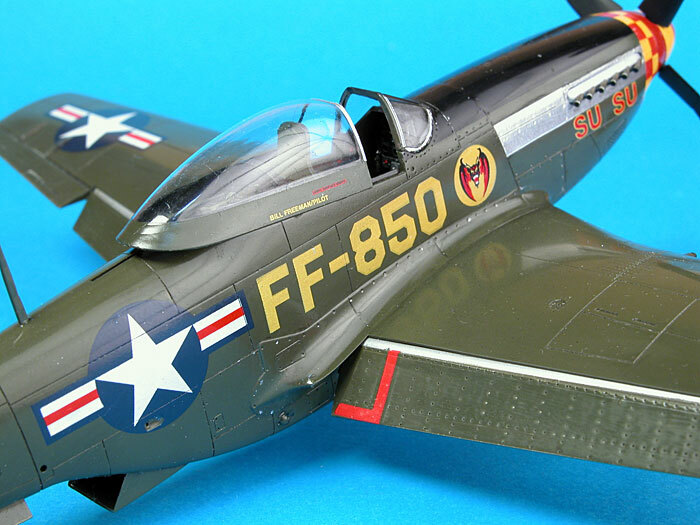 One of the reasons that I like Polly Scale acrylics is because it dries fast to a rock-hard finish that resists fingerprints and does not wear off the high-traffic areas of the model (such as the trailing edges of the wings) like some other acrylic paints. Self-adhesive aluminium foil was used for the prominent metal panels around the exhaust. The foil was cut slightly larger than the panels, then peeled from its backing paper and stuck to the painted plastic. The foil was burnished into the panel lines with a sharpened stick, and a new hobby knife blade was run around the outline. The excess foil was then lifted off the model and discarded. There were no commercial decals available for "Su Su". 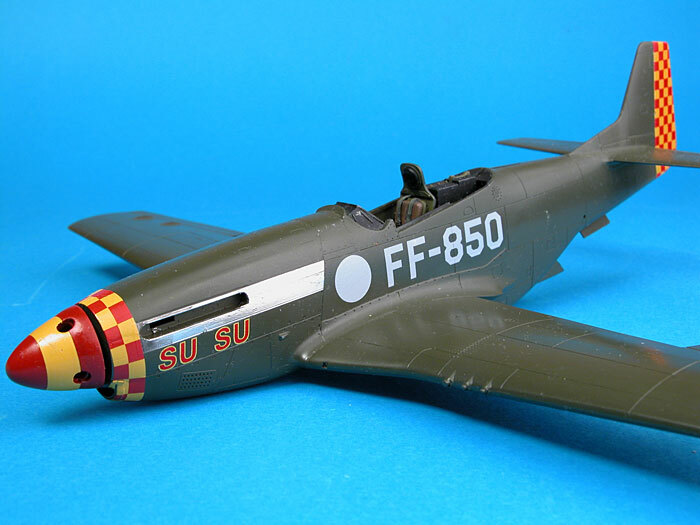 I could use the 357th FG red and yellow nose checks from an Aeromaster decal sheet, and I also had national markings and yellow buzz numbers on sheets in my decal box, but Su Su's unique markings simply did not exist in 1/48 scale. Mike Grant Decals came to the rescue. I sent Mike several photos of the aircraft and he created the tail and gear door checks, the buzz numbers, serials, fuselage emblem and various stencil markings - including the "Bill Freeman - Pilot" lettering on the canopy. These decals are produced on an ALPS printer, so the yellow markings were supplied with separate white backing to ensure good colour saturation against the dark green background. The glossy finish delivered by the base coat of Polly Scale Dark Green and Clear Gloss was buffed in preparation for the decals. I tackled the toughest decalling jobs first - the nose checks and spinner stripe. 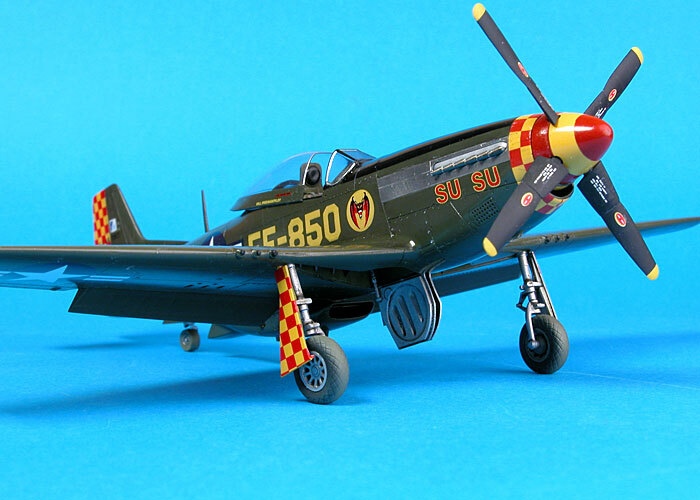 First the spinner was painted a shade of red to match the checks, then the yellow decal stripe was applied. This settled down nicely after a generous application of Micro Sol. The nose checks were similarly trouble free. 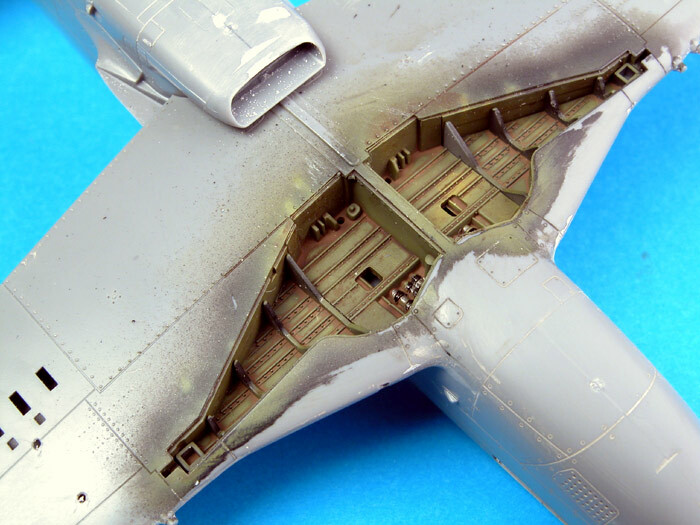 At this stage the undercarriage doors and the rudder were painted gloss yellow in preparation for the red checks. 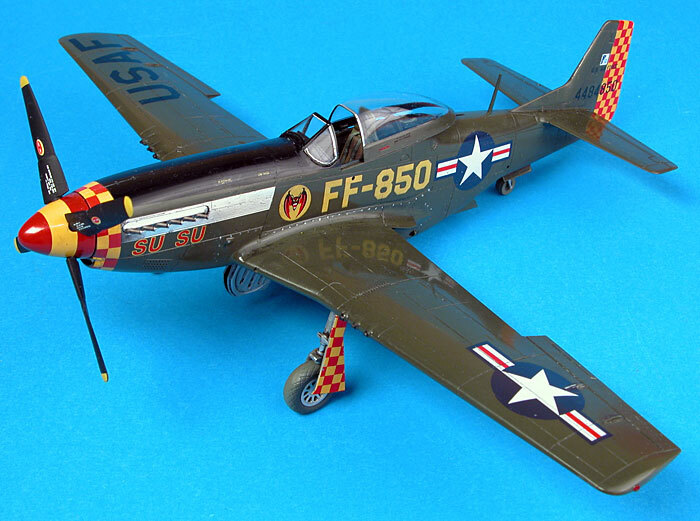 Mike Grant's decals were cut out of the sheet and applied to the model. Apart from cutting them out, the method of application is the same as any other decals. The white backing decals were laid down first. I was careful to cut a slightly larger outline around the white markings to avoid the carrier film from the yellow markings overlapping the backing decals (I was worried that this might cause silvering problems later). The precautions were justified - no silvering on any of the decals. 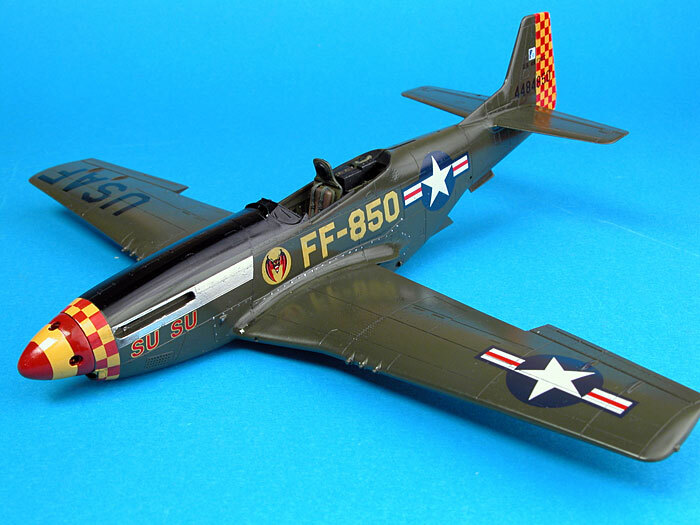 National markings were sourced from a Cutting Edge Skyraider decal sheet. I spent some more time looking at reference photos and realised, for the first time, that there was a black anti-glare section on top of the nose. 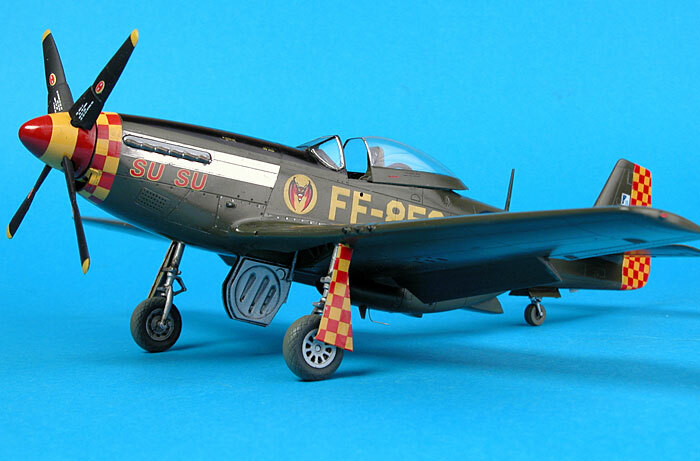 Although masking around the decals and foil was a little harrowing, this major feature was added with no ill effects. With the decals applied it was time to grit my teeth and start glossing the model. I sprayed the entire airframe with Future floor polish. The first coat was a little patchy so I sprayed a second. This covered better than the first attempt and was certainly very glossy, but it gave the model a wet look - not really what I was after. I lightly dry-sanded the surface of the model with 4,000 grit Micromesh cloth, followed by polishing with 8,000 grit. Now the finish was looking better. At this stage I brushed on a thin wash of black oil paint. After drying overnight I wiped the excess off the model, leaving a subtle residue in panel lines. However, to my horror, I saw that I had not only removed the excess oil wash but also several chunks of the custom decals! Fortunately, Mike had supplied two sets of decals. I reconstructed the buzz number and completely replaced the port-side "Su Su", and half of the same decal on the starboard side. A final coat of Future sealed in the new decals. The Micromesh cloths were once again used to smooth and polish the surface. 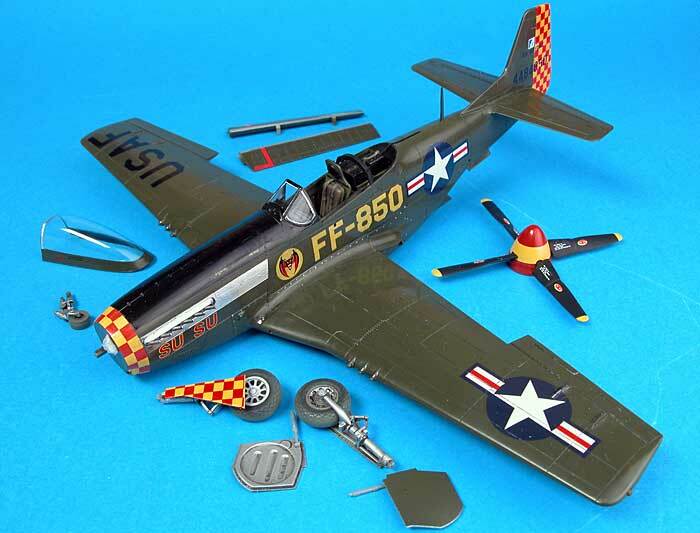 Perhaps the weakest aspect of Tamiya's P-51D Mustang kit is the engineering of the sliding canopy section. 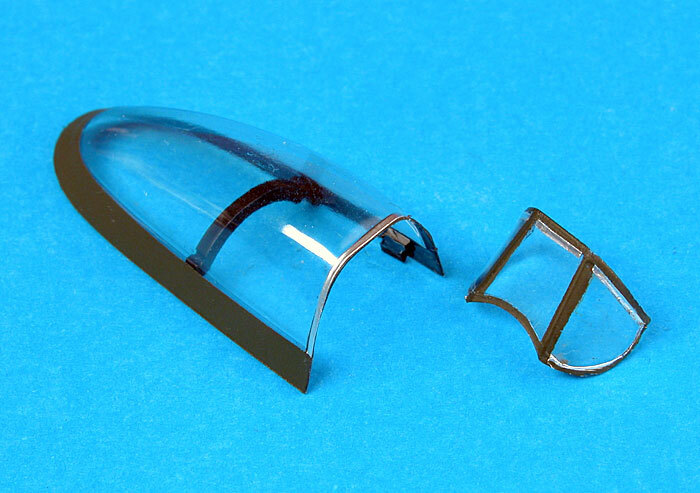 The clear "bubble" and the canopy base are supplied as separate parts. It is almost impossible to join the parts without glue marks and/or an obvious seam. I replaced this section of the canopy with a vacform part from Squadron. 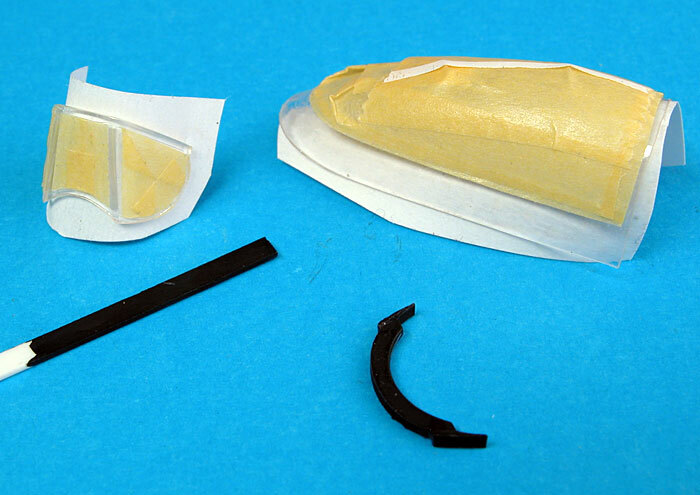 The arch-shaped brace was cut from the kit canopy base using a pair of side cutters and trimmed to fit inside the vacform canopy. This brace was later glued to the rear cockpit deck as a mounting aid for the thin vacform part. 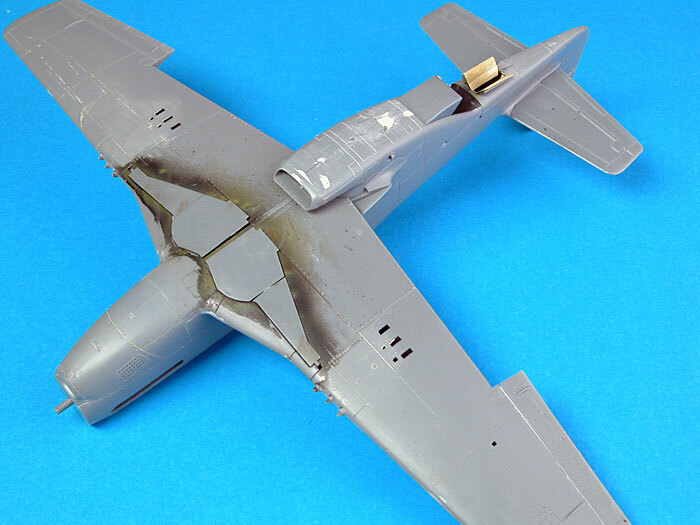 I also cut two small pieces of styrene strip, which were glued to the inside of the canopy frame near the front as additional mounting points. The kit canopy has a difficult seam between the clear section and the frame. This part was replaced with a vacform canopy from Squadron. All the components gathered for final assembly. Thin strips of self-adhesive foil were attached to the windscreen and the canopy, representing the bare metal seen on the real aircraft. Once the clear parts were decalled and foiled, I sprayed them with Future too. I broke my "straight from the box" approach and added a blade antenna, a trailing antenna and a small fairing behind the tailwheel. All of these modern features were obvious in photos of "Su Su". There was no gunsight visible in photos of the aircraft, so this part was omitted. The rest of the kit was assembled per instructions. "Su Su" presented an excellent opportunity for me to try something different - a high gloss finish. I found this to be an interesting and challenging project. I will not fear a high gloss finish in the future - but I will still show it a healthy respect!